Friends of Bolton Lakes (FBL) is here to protect and enhance the ecological health of Connecticut's Bolton Lakes, their surrounding areas and watershed. Established as a non-profit organization in 2013, FBL is filling a long-overdue need to speak with one voice about the needs of our local lake resources. Lake Monitoring Training scheduled for Monday postponed to Wednesday due to the weather. ​FBL has had an active, ongoing, water-quality monitoring program for the Bolton Lakes since 2014. Now Northeast Aquatic Research (NEAR) has asked for our help in collecting additional data from Middle Bolton Lake. In turn, we are asking for volunteers to help with this additional monitoring as well as for our ongoing three-lake monitoring program. The work will involve taking measurements and collecting water samples in shallow water near the boat launch and spillway, and in deeper water. The intent is to learn more about the flow of nutrients between the lakes. The Town of Vernon, understanding the importance of this work, has agreed to sponsor a training session by NEAR for people who are willing to help. There is no firm date for the training at this time, but it will be sometime during the last two weeks of April. There is limited space on NEAR’s boat, but most of the training be at the Hatch Hill boat launch. Because of the short time window, please let us know by Tuesday, April 9th if you'd like to volunteer by using the Contact Us link. Thank you. ​On Monday, March 25th at 7:00 PM at Bolton Town Hall the Town of Bolton held a public meeting focused on Lower Bolton Lake. Dr. George Knoecklein of Northeast Aquatic Research presented the results of last year’s studies and follow-on plans for 2019. Link to map showing the locations of five small patches of invasive curly-leaf pondweed in Lower Bolton Lake documented by the Invasive Aquatic Plants Program (IAPP) of the Connecticut Agricultural Experiment Station as part of their summer 2018 survey of Lower Bolton Lake. Please read the latest FBL newsletter posted on the FBL Newsletter page. The Friends of Bolton Lakes held their Fifth Annual Bolton Lakes Watershed Community Forum at Bolton Town Hall on Monday, October 22. Ray Frigon, Supervising Environmental Analyst in DEEP’s Water Planning and Management Division provided an update on the planned Hatch Hill dam improvements as well as information on their role in dam projects throughout the state. In addition, Debby Zeppa of the Coventry Lake Advisory and Monitoring Committee gave a brief update on the invasive Hydrilla that is present in Coventry Lake. The FBL annual member meeting was held prior to the forum. Agenda items included election of directors and the annual treasurer’s report. Two board members had their terms extended - Shelly Jewell and Leona Crosskey. The members elected two new board members - Jason Seacat and Paul Senk. The forum was well attended. The speakers were informative and there were lively discussions about the presented topics. If anyone is interested in committing some of your time and talent to working with the FBL on behalf of the community and the lakes, there are occasionally short-term projects where we need volunteers. Currently those include working on the rain garden, fall and spring clean-up, and boat launch ambassadors. Boat launch ambassadors educate boaters about checking their boats for weeds as they come into the boat launch areas. If you are interested in helping the FBL or if you are on the fence and would like more information, we urge you to contact us. find a suspicious aquatic plant? it is now easier to report it. 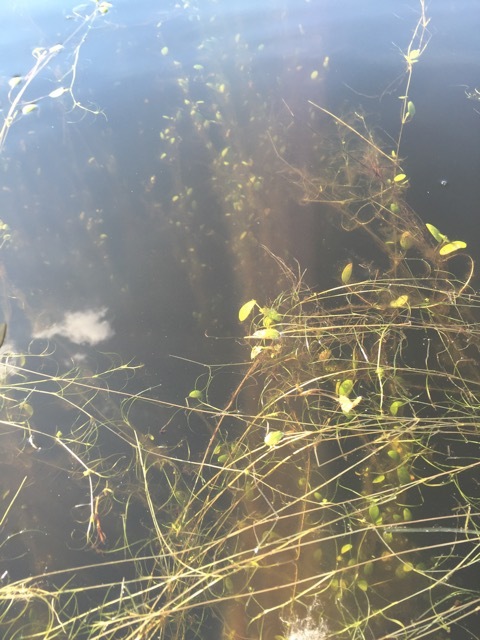 If you spot an aquatic plant you suspect is non-native or invasive in Lower, Middle or Upper Bolton Lake, including Cedar Swamp, use our new Suspicious Plant page to report it. You can report a suspicious plant with your phone when you see the plant (take a photo and fill out the form on the FBL site) or by using your computer (upload a photo to the form on the FBL site). The suspicious plant form enables you to enter all required information to help identify suspicious plants. You should still gather the sample and refrigerate it in a ziploc bag with enough water to keep it moist in case follow-up is needed. The 2019 membership drive has begun. We hope you join us or renew your membership now. We have tried to anticipate some of your questions in our new Membership FAQs page at the link below (and in the menu). Because FBL is a registered public charity, many employers will match your membership dues and other contributions. We encourage you to apply for a matching gift if your employer offers one. Kim Welch, the Town of Bolton’s Lake Commissioner, has announced that the Eastern Highlands Health District has lifted the health advisory on Lower Bolton Lake. The lake is open for all uses. There was no construction in 2018. Bids will be taken this summer, and construction is expected to begin in the fall of 2019. You may have noticed signs at the Hatch Hill boat launch and Newhoca Park announcing a health alert for Middle Bolton Lake. These signs were put up in error. There is no health alert for Middle Bolton Lake. Unfortunately, the health alert for Lower Bolton Lake remains in effect. The erroneous health alert for Middle Bolton Lake was also reported in the Journal Inquirer. On September 6th the North Central Health District corrected the signage at the access points to Middle Bolton Lake and issued an updated health alert that correctly reports that the current algae bloom is confined to Lower Bolton Lake. While we discourage portaging over the dam from Middle to Lower Bolton Lake, the signage at Middle Bolton serves to warn lake users who might cross into Lower Bolton Lake unaware of the algae bloom there. Kim Welch, the town of Bolton’s Lake Commissioner, has reported that the current bloom in Lower Bolton Lake is blue-green algae. This type of algae poses health risks to people and pets. The complete text of the alert issued by the Eastern Highlands Health District is included below. Please be attentive to the lake-use restrictions spelled out in the alert. More information on blue-green algae blooms can be found here on Connecticut’s Department of Public Health’s website. The Spring Seminar was held on Wednesday, May 23rd at 7:00 PM at the Notch Road Municipal Center, located at 106 Notch Road in Bolton. The seminar featured a talk by Cynthia Stevens of the Ball Pond Advisory Committee in New Fairfield, Connecticut. Cynthia described their experience with introducing sterile grass carp to control Eurasian Water Milfoil and Southern Naiad in Ball Pond. In addition, the meeting included an update on the status and plans for addressing the fanwort found in Middle Bolton Lake. lower bolton lake informational meeting March 29, 2018 7:00 p.m. There was a public informational meeting on Thursday, March 29th, 7:00 P.M. at the Bolton Town Hall (222 Bolton Center Rd, Bolton, CT) regarding the continued work at Lower Bolton Lake. Consultant George Knoecklein of Northeast Aquatic Research reviewed 2017 activities and findings and future follow-up. ​Click here to see the 2017 Lower Bolton Lake Report. ​Click here to see the 2017 Lower Bolton Lake presentation. As predicted, the tick population has increased. be aware of what to look for and what to do it you find a tick. The Connecticut Agriculture Experiment Station provided an informative document. The Friends of Bolton Lakes conducted their annual aquatic plant surveys of Lower and Middle Bolton Lakes on 7/20-21/2016. The surveys were performed from pontoon boats circumnavigating the lakes and following up on guidance from lake residents. The great majority of responses to our request for input came from Middle Bolton Lake residents whose concerns included the proliferation of milfoil, pondweed, lily pads, cattails, and phragmites. The top-level finding is that at the time of the survey Lower Bolton Lake was generally clear of obstructive plants but Middle Bolton Lake has experienced prolific growth of both native and non-native aquatic plants. obstruction of some waterfront properties by phragmites/cattail beds and lily pads. We submitted samples of the most prevalent pondweed in Middle Bolton Lake to both Northeast Aquatic Research (NEAR) and the CT Ag Station. Both identified the weed as Potamogetan Bicupulatus, also known as “snailseed pondweed.” Unlike milfoil this plant is not likely to spread through fragmentation but it is a prolific seed-producer. A link to a photo looking into one of its beds, taken by a lake resident, is below. We forwarded our report to Joyce Stille and Kim Welch at the Town of Bolton, John Ward and Steve Krajewski at the Town of Vernon, and Dr. George Knoecklein and his team at NEAR. Further, we requested that the Town of Vernon ask Dr. Knoecklein to look into the current Middle Lake situation as soon as possible to determine what may have caused the dramatic change in the conditions there and what might be done to address it. The documentation of our surveys is attached. In the report you will find maps showing the routes taken on Lower and Middle Bolton lakes and tables of the plants spotted at each observation point. Thanks to all who provided input to help focus our survey and for your continued support. As a concerned group of citizens, FBL is dedicated to preserving our lakes (Lower, Middle and Upper Bolton Lakes) and watershed through research, education and public awareness. These lake ecosystems are major natural resources for the Towns of Bolton, Vernon, Coventry and Tolland. Sustaining their environmental quality is the joint responsibility of FBL, these Towns and the State of Connecticut. To report trespassing, illegal activity on Town property (beach at Indian Notch) call State Police Resident Trooper at 860-643-6060.